I’m going to speak from experience here because it’s been a long road. The first 2 years I worked on Xamarin and mobile projects, I used a Windows machine, it was a decent laptop with an Intel Core i7 chip, 16 GB of ram and an SSD, not bad, right? Well, for any other task, yeah, it was perfect, but for Xamarin, it struggled. Loading solutions was slow and deploying/debugging with Android emulators was glacial. Debugging iOS was a huge pain; yes, Visual Studio has the ability to connect to a Mac build agent, but it’s unreliable, buggy and requires an exact version match. Too many moving parts. I took the plunge about 2 years ago and began using a MacBook Pro full time and let me tell you, it has been a huge improvement. Visual Studio for Mac is fast and lightweight, you can run/debug iOS and Android on one piece of hardware and it’s really fast to deploy to the iOS Simulator. Switching provided a massive boost to my development productivity. Furthermore, I didn’t even have to turn my back on Windows, I can dual boot with Bootcamp and run Windows inside a VM using Parallels. The best of both worlds! With almost 3 years of full time macOS use behind me, here are my observations/recommendations to help ease the transition from Windows/PC to Mac. Hardware – I have a MacBook Pro (Retina, 15-inch, Mid 2015). I ordered this laptop in early 2016 when the newer models were announced. Looking at the benchmarks at the time, any performance benefits from the marginal CPU upgrade in the new models were far outweighed by the cons (lack of connectivity ports, no dedicated power port, bad keyboard). No regrets, this machine is a workhorse, decently fast, good battery life and handles a VM nicely. 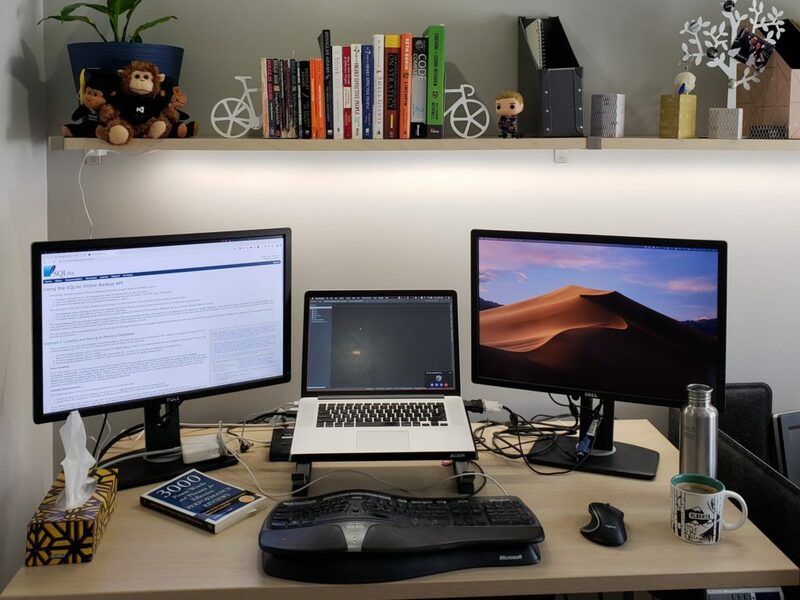 Peripherals – In my home office, I use a DisplayLink USB 3.0 dual HD dock to drive twin 24″ 1920×1200 monitors that flank my laptop stand. This dock always worked wonderfully with my Windows machines, but was always a bit finnicky with my Mac and had much higher latency than plugging in the display directly. Since 10.13 “High Sierra” I have abandoned the display capabilities of the dock completely. High Sierra implemented changes which broke the dock’s capabilities. I now plug in both monitors, one to HDMI and one to mini DisplayPort. Frustrating to manage all the cords/connections, but the displays have lower latency with a direct connection. Networking – macOS has no concept of a metered connection like Windows or Android. If you spend any amount of time using a portable hotspot/tethering/limited wifi, you will want to grab TripMode. If left unchecked, your Mac (and it’s applications) will treat all your connections like an unlimited, high-speed link which will cost you time and money. Virtual Desktops – “Spaces” work relatively well. There tends to be a few bugs and hiccups, but they’re certainly handy. Window Management – You’re going to miss Window’s snapping features more than you will ever know. Get a replacement, I recommend Magnet. Windows users will also need to get used to the fact that the “Maximize” doesn’t exist and the green button in the top left of the application title moves the application to a dedicated space/virtual desktop. You can split the screen in full screen spaces similar to snapping, but it’s restrictive and irritating. Google Drive – the new Google Drive File Stream is generally ok. You will want to close it if you’re on a slow/unstable connection as it tends to start eating CPU. The last few @Outlook for Mac updates have made me want to throw it away and find something better. Crashing/hanging/eating CPU+memory, switching from mail to calendar view fails often, can't drag calendar appointments (when I can get to calendar). Using the tools and techniques described above can help your productivity on a Mac. Overall, the switch will be a bit rocky if you’re unfamiliar, in the end you will move much faster and ship your apps sooner by using a Mac! More to come next time when we talk about IDEs and development tools. Here we go, another attempt at blogging! So much has happened since I last wrote, 3.5 years ago. I have been running a user group, Toronto Mobile .NET Developers Group for the past 18 months and it has been a fantastic experience. Organizing a user group/meetup can be a lot of work and it is very rewarding. I have met so many brilliant and awesome people, learned how to organize and promote the events and picked up some great skills. As part of the group, I have been presenting regularly at my group and others. Presenting tends to play to my strengths, I can be informal and casual and I get immediate feedback from the community. That being said, text is powerful; it can be skimmed, indexed, quoted and referenced much easier. With that in mind, I am going to give blogging a more serious, earnest effort moving forward. Food arrives at 6pm presentation begins at 6:30pm and should last roughly 1 hour. Discussion and networking to follow. Late last week, I had an untimely incident with my phone. Right before my sprint review, a mug fell a mere 3 inches on my OnePlus One cracking the screen causing the digitizer to stop functioning. This was the first phone which I have ever broken. I don’t use a case and I take good care of my hardware, generally I will use a phone for 2-3 years. Very frustrating, considering I didn’t even drop the thing. Additionally, this was a replacement phone, my first OnePlus One had a defect, this one was only 3 weeks old! Anyhow, in a panic, I ordered a 3rd gen Moto G, it cost me $260 off contract, delivered to my door. I have been using it since Wednesday and I must say that I am very pleased with the device. Sure, the OnePlus One is a bit snappier and allows you to keep more apps in memory, but for a budget smartphone, I would highly recommend the Moto G.
ArsTechnica has a more in depth review. We are planning on using the master-detail view for the Android version of the app while following the material design guidelines. For iOS the app will use a tabbed bar along the bottom of the screen and a settings icon in the navigation bar. I had made this decision after I had put together a proof-of-concept app using the master-detail view, slapped a nice coat of material design paint on it and paraded it around to a few people for some feedback. It looked really nice, shiny…at least in Android, but not to worry, I could make some OS specific adjustments for iOS. It seemed like a good direction. Where I expected the master navigation drawer to slide over the toolbar and tabs, it instead only slid over the detail page. This is particularly problematic since not all of the detail pages use tabs. 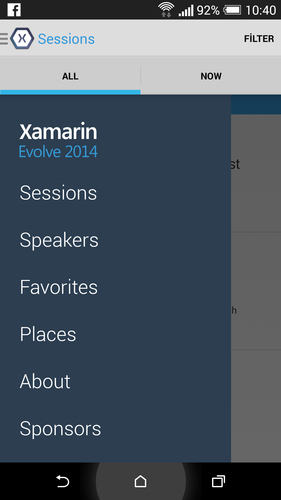 I found numerous posts of this behaviour and a Xamarin bug report. Apparently it’s expected behaviour and will not be fixed. I guess it’s back to the drawing board for the navigation…sigh. We had the sprint retro for our first 2 week iteration and did not have much to show for it. The learning curve of Xamarin, plus time for planning and time stolen by other projects caused the velocity to make a major hit. Only 4 of 8 story points were completed in sprint 1, the remaining 4 story points were pushed into sprint 2. Nevertheless, we did have something to show for it, a working app, themed to meet the client’s needs with login and data retrieval functionality which was integrate with the real life backend. There is quite a bit of learning left to do. We are working to find a good navigational flow for the app while ensuring it is visibly pleasing and meets the UI guidelines of both iOS and Android. We are planning on using the master-detail view for the Android version of the app while following the material design guidelines. For iOS the app will use a tabbed bar along the bottom of the screen and a settings icon in the navigation bar. A couple of notes here. I am constantly working between a “test project” and a real project. The test project gives me the opportunity to experiment with various UI changes such as styles, controls, flows without impacting/polluting the real project, a way to make mistakes with little cost. Second, I have ran into this build issue with the default Xamarin.iOS project multiple times and thought it would be a good idea to share it. That’s about it for now, just some quick tips from the trenches. Since iOS development requires a Mac, I have decided to look at the Hackintosh-on-a-VM route. Personally, I encountered a few different issues which the Troubleshooting guide helped me fix. I now have my VM up and running and ready for Xamarin configuration! $12,000 USD/year for the entry level plan?! You have got to be kidding me!